Compared to other professionals, freelancers seem to be a separate beast. They’re even a different breed than the rest of the online community. They pay whatever costs are required to be their own boss. Most became freelancers after having evolved to the point that the corporate shackles became more than uncomfortable, and they longed to break free and blaze their own trail. This evolved being now has mostly the same basic needs as the rest of the online community: feeds, /home, networks. But the freelancer seeks a different type of Web experience. You see, freelancers want to maximize their time online at every opportunity, to establish or build their business. They make contacts, hone their skills and solicit or share advice with others in their field to grow their businesses and create opportunities. For them, the online community is a kind of Freelance University, where they find mentors to lead class discussion and clients to assign projects. Below is a collection of some useful websites that no freelancer should do without. Whether because of the awesome resources and information contained therein or the oodles of opportunities they promise, these 15 blogs should be at the fore of any freelancer’s mind as they find their way in cyberspace. 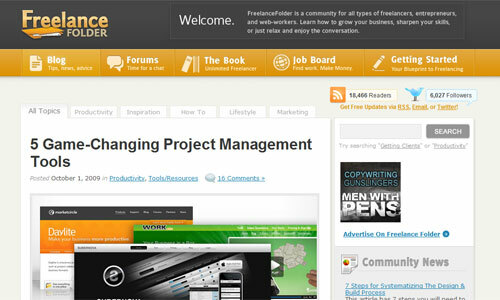 Freelance Folder is a multi-author blog dedicated to helping entrepreneurs and freelancers. Whether you’re a blogger, writer, publisher, designer, artist, small-business owner or entrepreneur, Freelance Folder is for you. You will find articles that provide you with the tools and information that you need to succeed! Freelance Switch is a community of expert freelancers from around the world. If you’re a freelancer, whether a young buck or seasoned veteran, this is the place to get all of the information and support you need! Errors and Omissions Insurance: Do Freelancers Need It? Well, the name pretty much says it all. All About Freelance is just that, a great resource for freelancers new and old and covers all things in the freelance arena. Guerrilla Freelancing is a website dedicated to helping every freelancer who is still in the trenches, working as hard as they can to build up a solid freelance business. The main objective is to be a voice for those who have not “made it” and provide straight-to-the-point advice and tips for the guerrilla freelancer. Are you a guerrilla freelancer? Wake Up Later addresses website-building, freelancing, blogging and online entrepreneurship. It covers a variety of topics, from freelance tips and programming to SEO and Internet marketing. It is a growing repository of Flash, audio and other stuff that are free for personal and commercial use. And it encourages the sharing of ideas and experiences through interviews and groupthink. All Freelance Directory is a directory and blog aimed at freelancers, consultants and the self-employed. It offers advice and many helpful tips and resources for home-business owners. Freelance Venue is where freelancers can network. Join the Freelance Forum and connect with other freelancers on the Web. The website is dedicated to anything about freelancing: working at home, business opportunities, money-making opportunities and so much more. How to Get Traffic or Visitors To Your Website WITHOUT Google! When people hear the words “freelance writer,” they often think of a starving individual tapping away at a keyboard for hours on end. While Pro Freelancing owner Chad does love typing away, he has accomplished a lot in his short time in the business and has built a successful foundation for his long career ahead. Why Aren’t People Buying Yet? The Podcast for Freelancers (which, ironically, also includes a blog) serves all those who currently or aspire to freelance. Whether you’re freelancing or want to, this website will help. 10 tips for freelance twitter-ers. The Self Employed Blog was created to share ideas, products and opportunities that help others move closer to their dream of being their own boss. The content focuses primarily on home-based businesses run on the Internet. Social Media Rockstar is another fantastic resource for freelancers who need a little guidance navigating the social media landscape, because social media is so key for freelancers. Is Social Media Marketing a Rat Race? Zen Habits is about finding simplicity in the daily chaos of our lives. It’s about clearing the clutter so that we can focus on what’s important, create something amazing and find happiness. Zen Habits features three powerful articles a week on such topics as simplicity, health and fitness, motivation and inspiration, frugality, family life, happiness, goals, getting great things done and living in the moment. Persuasive.net offers a wonderful way to learn persuasive communication, providing compelling articles without the fluff that usually accompanies content from trainers in the personal development industry. The Simple Dollar is a blog for those of us who need both cents and sense: people fighting debt and bad spending habits while building a financially secure future and still affording a latte or two. Our busy lives are crazy enough without having to compare 500 mutual funds; we just want simple ways to manage our finances and save a little money. Six Pixels of Separation is a blog by Mitch Joel. Mitch brings you digital marketing, new media and personal branding insight, provocations and foreshadowing from his always on, always connected world. This is a good start but by no means should be mistaken as the journey’s end. Below are other resources that every freelancer should check out. So many more helpful hints and tools are contained on the following websites that you would be remiss to have come all this way and not give them a glance or two. Go ahead: you know you want to! The successful home freelancer’s guide. Help with the small-business paperwork, the basics of accounting, and an overview of some legal considerations. While a lot of these items are focused on Web design elements, such as photography, programming and writing, something is included for everyone. 200+ resources for freelance Web designers. Thanks for including Guerrilla Freelancing. I knew 9 of the sites but am finding out about 6 of them for the first time :) Awesome post. Thanks for this post, given me a lot of extra reading! Excellent list, thanks for putting this together. Great list! Especially the outstanding posts. Lots to look at. I’d like to humbly suggest http://www.freelanceadvisor.co.uk for anyone in the UK wanting something a bit more local. We cover UK tax issues, have a forum, jobs, events, etc. One of my favorite blogs that I actively ready is Zenhabits! He writes the most inseparable posts. Hi this is really useful will pass to all my freelance friends and colleagues I’d only heard of 4 of them so proves I’ve been missing out! Hey everyone, thanks for the feedback and kindness! Glad the post is proving useful. Great and useful post. There is another site, http://www.elance.com that I think should be included. And, though it is a shameless plug, I also run an artist site called ArtAnywhere.com where artist can lease out or sell their work. Since artists are in a way freelancers too, have a look and let me know what you think. Always happy to get feedback. Thanks for this set of tools and links. Rob, what sites are good for employers looking to hire freelancers? I am especially interested in medical writers and editors, as well as graphic designers (both print & web). Like many others I’m partially freelance, and these sort of resources are utterly invaluable. Where would we be without the internet, and without posts like this?! Hey Bowen, thanks for sharing such a resourceful post. It is helping me a lot, and hope it will help freelancers like me in future also. Keep posting. Hi, I like this blog, lots of good information, I have to subscribe it, can anyone aid me? It is been a year now and am not getting any projects from freelancer sites, where most projects are moved to the highly rated or very low priced quotes. We do not get any respect for our work and quality is compromised for the rate quoted. The top freelancer sites are like an online supermarket and sometimes act as a “fish-market” where your hard earned skills are traded for very low priced quotes. But interestingly! I came to know about http://www.hireprogrammers.in, where each freelancer is respected and they ensure best price for projects. Really very useful post. Every Freelancers should read this blog. There is another website http://www.hireprogrammers.in. It is one of the best freelancing website and giving better performance. I registered my project on this website. I got good Experience. Well this list of freelancing websites is complete awesome. I have almost visited all of these blogs and some of these bogs i do visit on regular basis. This is still a great list – I know it’s from a while back, but it’s still very relevant. Thanks for putting all of these resources together! !